Mostly one recognizes the very abstract Mumuye figures at once within african tribal art, although there is a large breadth at their forms. Couples of Mumuye figures aren’t very frequent. In the literature „ die Kunst des Schwarzen Afrika“ of J. Kerchache et al, Herder Publishing house 1989, we found a couple ( Number 121-122) . Thinking of african figures with pearls one of the most remarkable examples is the throne of a king in the museum of ethnology in Berlin. In 1908 the ruler Njoya of Bamun gave this throne of his father to the german emperor Wilhelm 2. Our Bulu monkey listed in our gallery under the number 55 is also mentioned in the above cited book of J.Karchache et.al. under the number 971 on pge 569. The Bruneaf (Brussels Non European Art Fair) has now become one of the leading exhibitions on african tribal art in the world. In the cataloque of the 17. Bruneaf was announced, that all objects published in the cataloque were approved by experts of african tribal art. The members of the committee were well known persons. We were very glad of knowing an expert team watching the Bruneaf. We visited the Bruneaf and admired a lot of really good african masks and african figures. But sometimes we could not understand that pieces of that quality were offered there. One important african figure to be visited on the Bruneaf was discussed everywhere. Some persons told us, they know the object and they didn`t believe in the authenticity. All this is of course to be regarded from the point of competition and of the own knowledge. Every collector will make the experience, that when he shows one of his african masks or african figures to a dealer or collector he will very often hear objections to the quality of his posession. And we admit that our opinion is not accepted by all other collectors too. This indeed is not so much a problem when you buy an inexpensive object of african tribal art. If you like it, what really does it mean when other say it is not old or not made for real use. The problem is given when the objects are expensive and you hope to get back the paid money one day. What to believe in? Even when the object of african tribal art was published in an auction cataloque or in a book or is offered in a gallery specialised on african tribal art, you are confronted with the opinion of the auction house, the book author or gallery owner. It is no independant judgement. Whenthe objects in a book are selected out of museum – or private collections by an expert, this is independant and as we think the best way of information. Independant experts for african tribal art would be a good way and there is no reason, not to have them. If you buy a picture you can get an expertise and when you aquire a stamp for often less than EUR 100 a certificate is usual. The other way is to become an expert of african tribal art yourself. It is never a neutral expertise and its quality depends on your experience. To become an expert for african tribal art you have to work for very hard. Think of a tennis player or golfer how long he must work to be outstanding. Coming back to the experts of the Bruneaf we could read in an email of D.Norden to his clients reporting from the first antique fair this year that the last years experts were exchanged and a new committee was established with stronger rules. Important is the consequent following of the route. It may be difficult, but one day independent experts in the field of african tribal art will be normal. We are looking for the next Bruneaf and will try to find out, what changes happened. A collector first of all is confronted with the hygine of such items. figures. Therefore textiles and fibers of the objects should be old too. beneath the textiles or woven fibers. distract from what- you have to find out. The creation and usage of african tribal art for ceremonial or ritual purposes is widespread in africa. Masks and figures play a very important spiritual and functional role in the community. For collectors it is the spiritual and the aesthetic aspect that makes the african tribal art, for us especially the masks and figures so interesting. Collectors with mainly interests in ethnological respect will look more for the differences in the produktion and function of tribal art.Africa is widespread with many tribes and different cultures. What items of tribal art do we collect? We believe in the miracle in african tribal art. African masks and figures have their sole expression, that together with their unique shapes and forms goes directly into the heart.We are deeply impressed by the items. 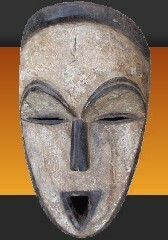 We want to share this feeling with others interested in authentic african masks and figures. During the times we have gathered a lot of experience to read the patina of african tribal art. This helps us together with the feeling of an outstanding expression of a figure or a mask to select old and true african tribal art. On the other hand: We are not speaking about modern artefacts.